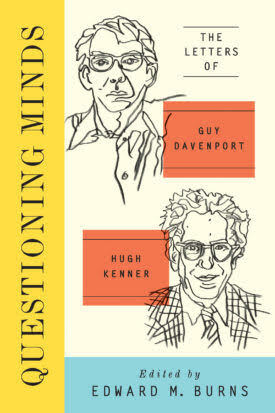 Hugh Kenner (1923–2003) and Guy Davenport (1927–2005) first met in September 1953 when each gave a paper on Ezra Pound at Columbia University. They met again in the fall of 1957, and their correspondence begins with Kenner’s letter of March 7, 1958. In the next forty-four years, they exchanged over one thousand letters. An extraordinary document of a literary friendship that lasted half a century, the letters represent one of the great and―with the dawn of the age of text and Twitter―one of the last major epistolary exchanges of its kind. Students and lovers of modernism will find, in the letters, matchless engagements with Eliot, Joyce, Beckett, Flann O’Brien, Basil Bunting, Charles Tomlinson, R. Buckminster Fuller, Stan Brakhage, Jonathan Williams, and the American modernists William Carlos Williams, Marianne Moore, and Louis Zukofsky. The correspondence ends with Kenner’s letter of August 9, 2002, lamenting how they had drifted apart. Please join us for an evening with Professor Edward M. Burns to discuss this landmark publication. EDWARD M. BURNS is Professor of English at William Paterson University of New Jersey. His edited works include A Passion for Joyce: The Letters of Hugh Kenner & Adaline Glasheen; A Tour of the Darkling Plain: The ‘Finnegans Wake’ Letters of Thornton Wilder and Adaline Glasheen. He is co-editor of TEXT: An Interdisciplinary Annual of Textual Scholarship.